Blacklist refers to a list of domains or email addresses for which delivery of emails is blocked. Blacklisting prevents a user from sending a message to the intended recipient. Email delivery management tools can be employed to avoid blacklisting. Blacklisting also occurs when one IP address has been blacklisted. 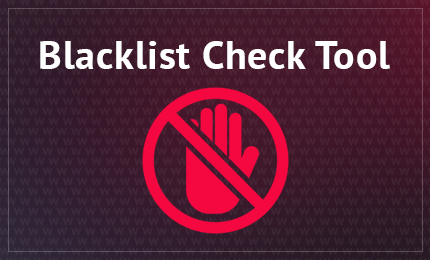 In these instances, the blacklisting can, in fact, spread to other domains. Almost every day, thousands of websites become victims of cybercriminals. Sometimes, hackers secretly place on the page a malicious code capable of recording keystrokes by users to steal their credentials or information about financial and banking transactions performed on the Internet. Malicious software can be so smartly hidden on the website that even experienced developers will find it problematic to detect it, not to mention ordinary users who own websites. On a global level, several companies have developed and maintained blacklists for different purposes. Most of them do have the goal of blocking spam in email systems. For instance, Google daily checks billions of sites and even warns visitors of dangerous resources in order to prevent theft of confidential data and infecting a user’s device with malicious software. Even though web applications are meant to provide comfort to the users’ online experience, they allow hackers to embed malware to websites. If not monitored correctly, web applications could become a threat. It is also possible for servers to expose a specific website to security threats. Most servers on the Internet work on extremely simple and vulnerable platforms like the FTP servers. There could also be problems with the setup and configurations of these web servers. Most administrators overlook these problems and fail to install the correct security mechanisms. This helps hackers to easily make their way to the targeted websites. Simple passwords allow hackers to access a particular website very easily. These hackers effortlessly compromise its security systems and spread malware in order to reach sensitive data. Password sniffing has become a common occurrence because of the increased use of FTP connections known for their vulnerability. They allow easy entry of Trojans and “sniff” the user’s login information which hackers use in order to access the user’s websites and spread malware. People who visit the “affected” sites expose their personal data, and websites that are related to them also become vulnerable. Malicious hackers and automated bots are out there to infect the websites with malicious computer code. In order to protect web surfers, search engines, security companies, and browser manufacturers will prevent users from visiting these compromised websites. Websites can become blacklisted for a number of other reasons. Some of these other reasons arise from the fact that websites that get hacked are mostly used to launch spam and phishing campaigns and also to send emails to Internet users trying to persuade them to buy pharmaceutical drugs, visit a fake banking site, or something similar. Comodo cWatch Web is a Managed Security Service perfect for websites and applications. This web security tool will provide you with a Web Application Firewall (WAF) provisioned over a Secure Content Delivery Network (CDN). It is a wholly managed solution provided by a 24x7x365 staffed Cyber Security Operation Center (CSOC) of certified security analysts and is powered by a Security Information and Event Management (SIEM) that can leverage data from more than 85 million endpoints in order to detect and mitigate threats even before they occur. As a blacklist preventing tool, cWatch through its CSOC is recognized for identifying and analyzing threats and then executing the necessary actions essential for maintaining optimal security. The CSOC extends a customer’s internal IT team’s capacity to protect systems, applications, websites, and networks and manage complex security incident investigations. Malware Monitoring and Remediation: cWatch will help in detecting malware, providing the tools and methods to remove it, and preventing future malware attacks. Web Application Firewall (WAF): This WAF from cWatch is a powerful, real-time edge protection for web applications and websites providing advanced security, filtering, and intrusion protection. Security Information and Event Management (SIEM): Advanced intelligence that has the potential to leverage current events and data from 85M+ endpoints and 100M+ domains. PCI Scanning: This scanning allows service providers and merchants to stay in compliance with the Payment Card Industry Data Security Standard (PCI DSS).